At the age of five, Mark began swimming in Texas to cool off from the intense 100-degree weather. When his family moved home to Calgary two years later he joined the Cascade Swim Club and launched his successful swimming career. After a few years of age group swimming with Cascade, Mark decided to move on to the University of Calgary Swim Club under the guidance of Hall of Fame coach Deryk Snelling. After 12 years of perfecting his technique and improving his conditioning, Mark made his first national team at the age of 17. Among his swimming achievements, Mark won a total of four gold medals at the 1986 and 1990 Commonwealth Games, both at the 100-metre backstroke and 4x100m medley relay. At the 1988 Seoul Olympics, Mark won a silver medal in the 4x100m medley relay. He then established five short course world records at the 100m backstroke in 1991 and 1992, and set another world record and won the gold medal in the 100m backstroke at the 1992 Olympics. Following his Olympic gold in 1992, Mark was a member of the Canadian Olympic Association, an Honorary Secretary of FINA’s Athletes Commission, an executive board member of the Toronto 2008 Olympic bid and an athlete representative on the International Olympic Committee’s 2004 Site Evaluation Commission. In 1999, he stepped down from all his positions within the Olympic movement due to a loss of faith in leadership. He went on to co-found OATH (Olympic Advocates Together Honourably), the first independent international athlete-led organization dedicated to restoring the Olympic Spirit as well as creating constructive solutions to the problems facing international sport. Mark is also a successful motivational speaker and has made numerous appearances on Canada AM, CNN, and ABC’s Good Morning America. 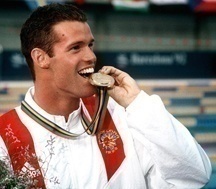 In 1993 he launched the Mark Tewksbury Junior Swim Bursary to provide program and financial assistance to young swimmers across Canada. Mark has also been a spokesperson for the Children’s Miracle Network, the AIDS Walk Canada as well as the Special Olympics, for which he as a member of the National Advisory Board.